It's that time of year for those of us living in Lafayette, Louisiana, Acadiana, and along the Gulf Coast. Are you prepared? Being pro-active and having emergency plans in place, or knowing where to turn for information or assistance, can keep you and your family safe. There are numerous online sites offering advice and tips to prepare for the hurricane season. However, the National Oceaninc and Atmospheric Administration (NOAA) offers a list of state and local emergency telephone numbers, media outlets, and evacuation information for Gulf South residents. 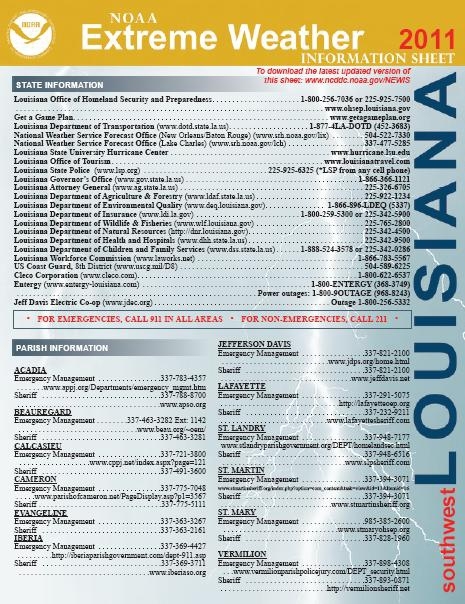 Their site is a 'one-stop' ready reference to help you prepare for these natural disasters. 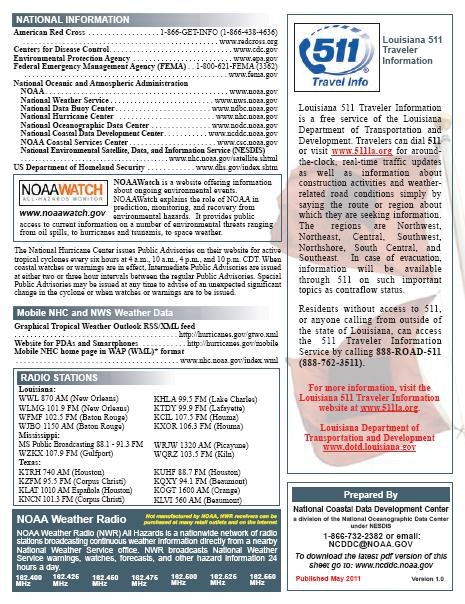 The above NOAA Extreme Weather Information Sheets are available by state in a down-loadable .pdf file: Southwest Louisiana & Southeast Louisiana, Mississippi, Texas, Alabama, Florida, Georgia, North and South Carolina. Are you prepared for the 2011 tropical storm season or other natural disaster? There's no need for your next home purchase or sale to be come a disaster. Count on i List For Less to help you prepare and plan for a successful transaction! We set the standard for EXCEPTIONAL SERVICE in Acadiana! i List For Less Realty is home officed in Lafayette, and services the surrounding communities of Abbeville, Breaux Bridge, Broussard, Carencro, Crowley, New Iberia, Opelousas, Rayne, Scott, Saint Martinville, Sunset, and Youngsville. DISCLAIMER: Mike Mayer and/or i List For Less, LLC disclaims responsibility for any of the content or opinions expressed in this blog, including, but not limited to content or opinions regarding any products or service mentioned. Mike Mayer and/or i List For Less, LLC disclaims liability for any damages or losses, direct or indirect. that may result from the use of, or reliance on, information contained in this blog. This blog may contain links to other web sites operated by third parties. These links are provided as a convenience to access the information contained therein. Mike Mayer and/or i List For Less, LLC disclaims any responsibility for the content of any other sites or the products or services that may be offered on or through those sites. Inclusion of a link to another site does not indicate any endorsement or approval of the site or its content. Mike Mayer and/or i List For Less, LLC reserves the right to edit, remove or deny access to individuals or content that it determines to be unacceptable, including, but not limited to, any illegal, abusive, profane, rude, defamatory, or anonymous comments. Copyright © 2011 By Mike Mayer and/or i List For Less, LLC. All Rights Reserved. I'm Eating Eagle For The 4th Of July - What Are you Serving? Did You Know We're Facing A 3. 8% Tax On The Sale Of Homes?